Children on streets live in insanitary conditions and are prone to various infections and diseases. Therefore, regular medical check-ups of the children are done at the full care residential centres and contact points. Individual health cards are maintained for each child. Whenever required, pathological tests are conducted as per the recommendation of the doctors. We have a full time doctor employed with SBT solely for this purpose. Apart from that we also invite external doctors or get our children treated by specialists at hospitals. Children are regularly vaccinated against hepatitis-B and tetanus. 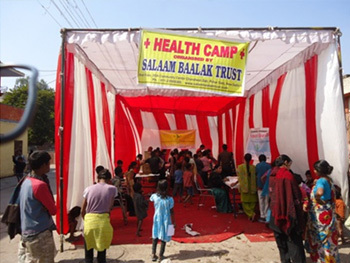 In addition health camps are organised at contact points to strengthen awareness and support the basic health needs of the communities. To meet the nutritional needs of children nutritionally balanced and hot-cooked meals are served at residential centres and contact points. The meals are prepared in the kitchen space provided at the centre under the supervision of staff members to ensure safe and hygienic practices. In some cases children have special nutritional requirements due to illness such as tuberculosis and malnutrition. Such children are provided with special nutrition including protein supplements, additional servings of fruits and milk as prescribed by the doctor. Delhi as a living space is a zone where a child's life is dominated by fear, anxiety, and anger. Exposed to the violence of the streets, these young children create a state of mind where everything external is threatening. Entering a residential centre then, starts off with a plethora of new challenges-a new environment, alien surroundings, new people, different lifestyle, and an irresistible temptation of returning to the same street life. To ensure that the purpose of bringing a child into a safe child-friendly space is not defeated - in 2003, SBT introduced a formal and full-fledged, Mental Health Programme (MHP) under the guidance of Dr Amit Sen. The MHP team consists of able and qualified counsellors who strife to build rapport with children and address their psychological needs. A referral system is in place through which children facing emotional and psychological difficulties can be referred to the counsellor by staff members including coordinator and teachers. This is followed by comprehensive clinical and psychological assessments of the referred children. In cases of serious issues such as the effects of trauma or depression, specialised therapies are employed to help children deal with these problems. Some of the therapies used by the MHP include cognitive behaviour therapy, art-based therapy, play therapy and group therapy. Apart from the referred special cases, from the first contact the counsellor conducts regular sessions with each child. Life Skill Education sessions are also conducted at periodic intervals with all children in SBT. Children are empowered to review and understand their coping strategies. The MHP team works in close synchronisation with other staff members. In this team work, great care is taken to keep principle of confidentiality and components of child rights intact. Children themselves can approach their counsellor didi or bhaiya when they feel the need to. The counsellors play varied roles - a close confidante with whom the children share their most intimate thoughts, a sounding board with which the children can release all their frustration and anger, a friend with whom they share their jokes, stories, joys and dreams. Most importantly, the counsellor's room is a space where each child goes to talk without the fear of being judged and disrespected. To bridge the psychological and educational needs of vulnerable children special education has been introduced. Apart from education in specialised schools, the children are also provided additional support by a caregiver and teachers. "Once there was a boy who had many behavioral problems. He was a rebellious and hyperactive child. He did not have any interest in studies either. After the intervention of Salaam Baalak Trust team, the child improved and a positive change was seen in him. After this we (Child Welfare Committee) ordered the Salaam Baalak Trust team to trace his family. The family was traced and the child was repatriated. Salaam Baalak Trust is still supporting the child's education so that he becomes a successful human being." "Kamya (name changed), whose parents are infected with HIV, has been with Salaam Baalak Trust since 2011. Though it was a difficult decision for her parents to let Kamya live in a residential centre, once they saw Kamya doing well, they were happy. "Kamya has changed a lot in Salaam Baalak Trust. Her personality has groomed and a positive transformation can be seen in her attitude and behaviour. She is performing well in her studies"